Preheat the oven to 180C. Line 2 or 3 baking sheets with greaseproof baking paper (or bake in batches). In a bowl, beat together the butter and sugars until light and fluffy. Stir in the flour and milk, vanilla and salt. Mix well then stir in the chocolate. Take heaped teaspoons of the dough and roughly shape each portion into a ball. Put on the baking sheets well apart to allow for spreading. Lightly flatten each biscuit with your fingertips, keeping the mixture quite rough-looking. 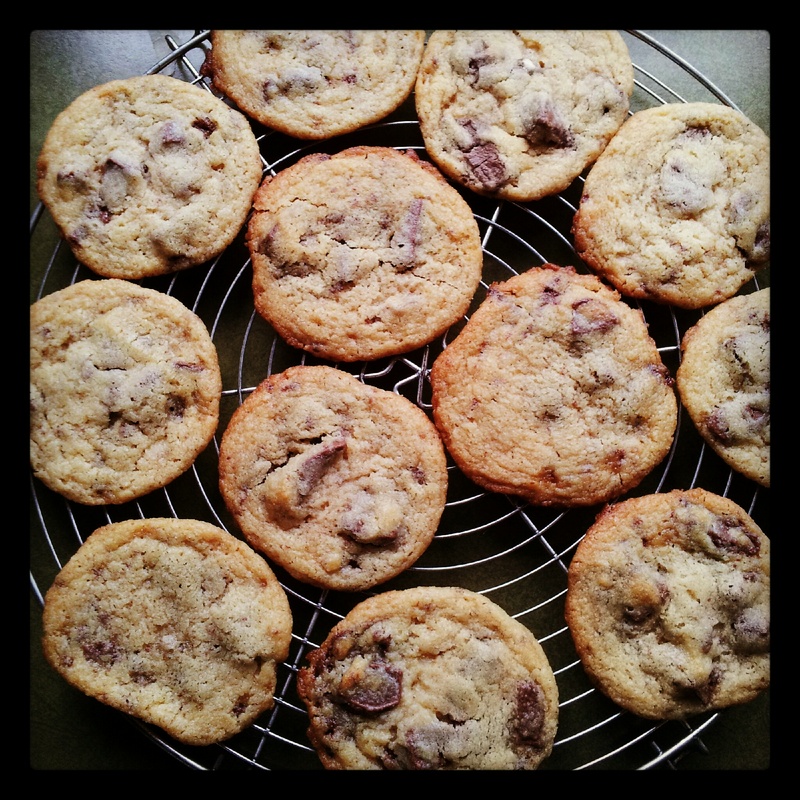 You should yield 18-24 cookies depending on how generous you’ve been with the portion size. Bake for 10-20 minutes (depending on size) until the cookies are pale golden around the edge, but still feel soft in the centre. Cool on the baking sheets for 5 minutes, then transfer to a wire rack and allow to cool a little more before eating. These are great with all varieties of chocolate orange. Dark chocolate oranges are the tastiest to use in my opinion. You can grate orange zest into the dough for a more intense orange flavour if you want or add some chopped nuts for crunch. 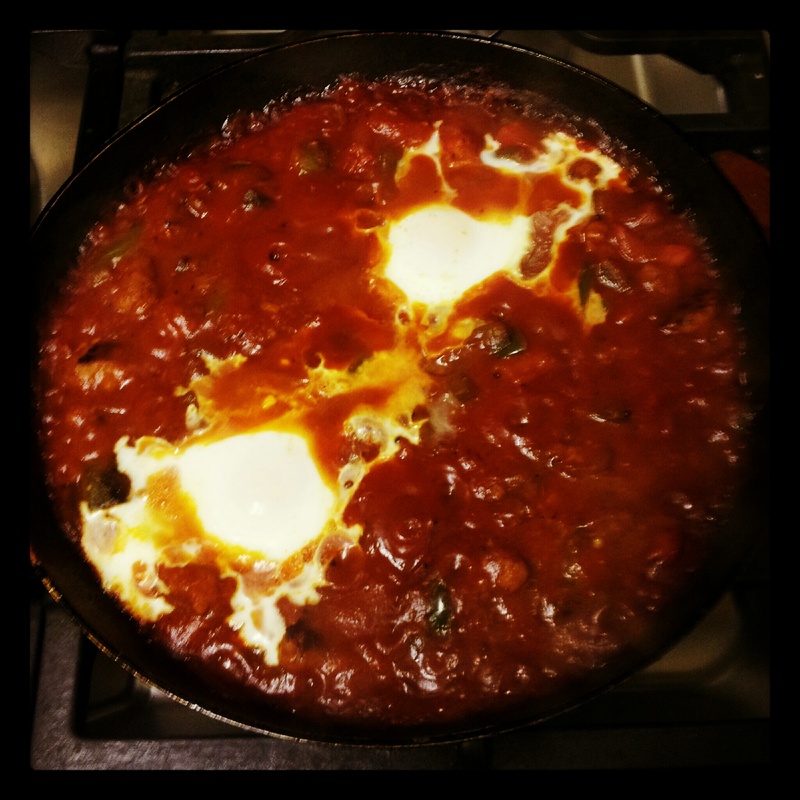 Originally of North African origin, Shakshuka is a dish of eggs poached in tomato based sauce flavoured with spices and herbs. Here, I have used roasted garlic and chillies for flavour but feel free to experiment to your liking. You could prepare up until the end of stage 3 in advance, freeze the sauce and have it ready to pull out of the freezer at any time for a quick meal packed with flavour. This recipe serves 2 for a hearty winter warming meal. Cook chilies on stove top until blistering and black all over, a few minutes on all sides. Put chilies in a bowl and cover with cling film. Let sit 15 minutes. While the chilies are cooling, heat olive oil in a large pan on a medium heat. Add the chopped onion and cook until translucent, about 5 minutes. Add the garlic and cook for a minute more. Add the passatta and a pinch of salt, the pepper and sugar. Bring to a simmer and lower the heat to low. Gently simmer for 15-20 minutes. Carefully peel and discard the blackened skin off of the chilies. Slice and add chilies (with some of their seeds for a nice heat) to the passatta. Continue to let the sauce bubble for a couple of minutes then remove from heat and set aside. In a cold frying pan, add the chorizo sausagemeat and bring to a medium heat slowly so that the natural flavoured fat is released. Once this happens, add the bell peppers and fry together for 6-8 minutes or until the peppers have softened but still have a little bite and the chorizo has browned nicely. Add the tomato sauce to the chorizo and peppers and stir to incorporate. Make two wells in the sauce and crack an egg into each one. Allow the sauce to simmer for a few minutes. The egg will begin to set but will not turn white straight away. To finish, place the frying pan under a preheated medium grill for 1-2 minutes just to set the eggs. The yolks should still be really quite runny. Serve with crusty bread rolls to dunk into the egg yolks and mop up the sauce. These are bloody lovely – enough said! Heat your oven to 180C and line and grease a 20cm square baking tin with baking parchment and margarine. Gently melt the peanut butter, chocolate and the sugar in a heatproof bowl over a pan of simmering water, stirring occasionally, until the sugar has just about melted. Remove the bowl from the heat, allow the chocolate mix to cool slightly and use a wooden spoon to beat in the eggs one by one. Stir in the salt and flour and scrape into the tin. Bake for 20-30 minutes until it has a crust, but the middle still seems ever so slightly uncooked. Cool completely in the tin before cutting into squares. I cut mine into 16 squares. 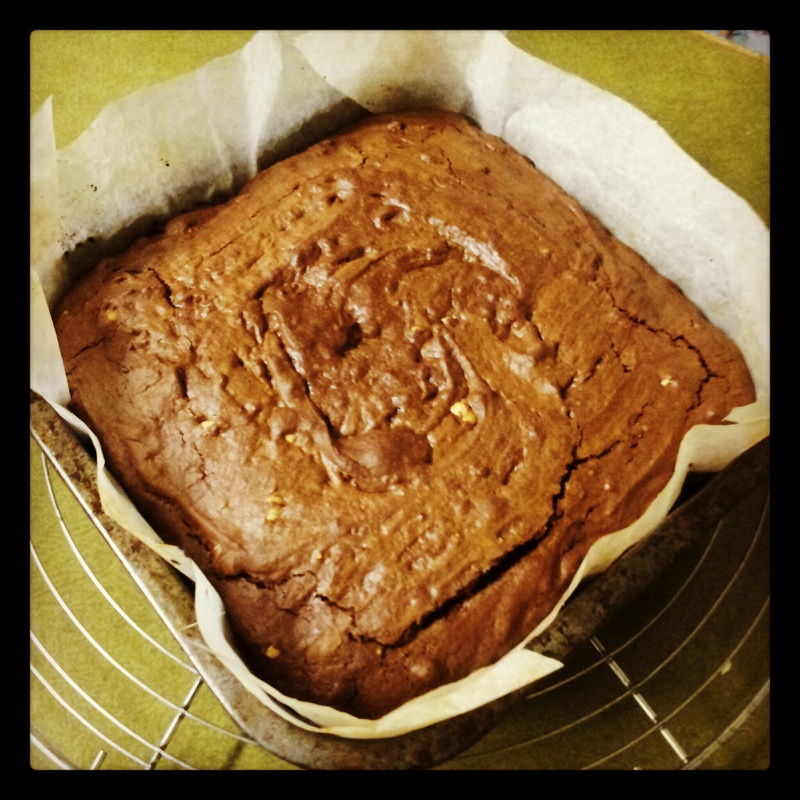 The brownies will continue to cook once removed from the oven. These are not cakey brownies. 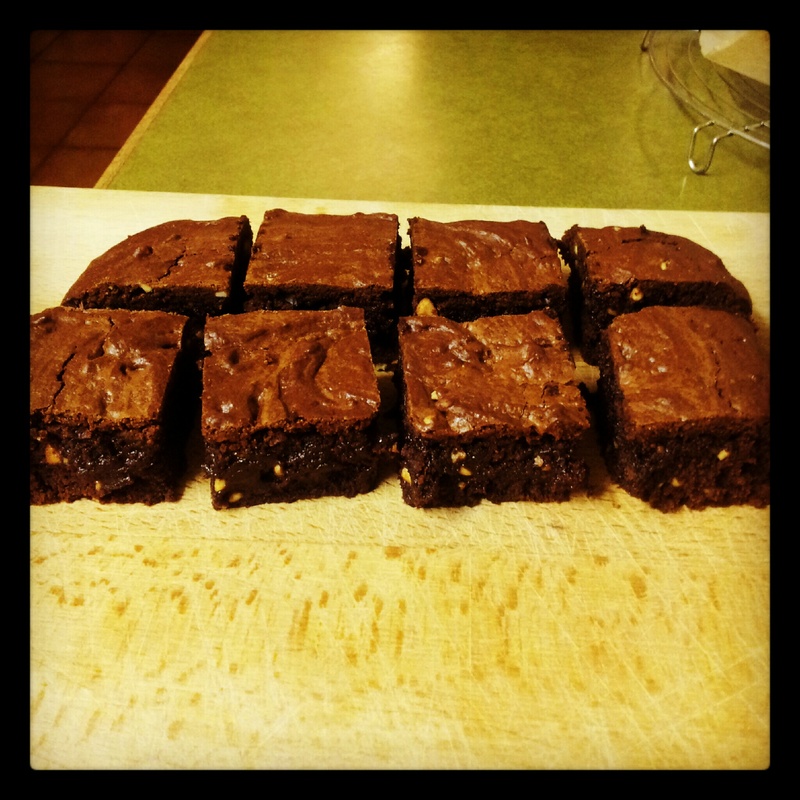 They are rich, dense, chewy brownies full of chocolaty goodness and crunchy peanut chunks accentuated by the touch of rock salt with a deepened flavour from the brown sugar. 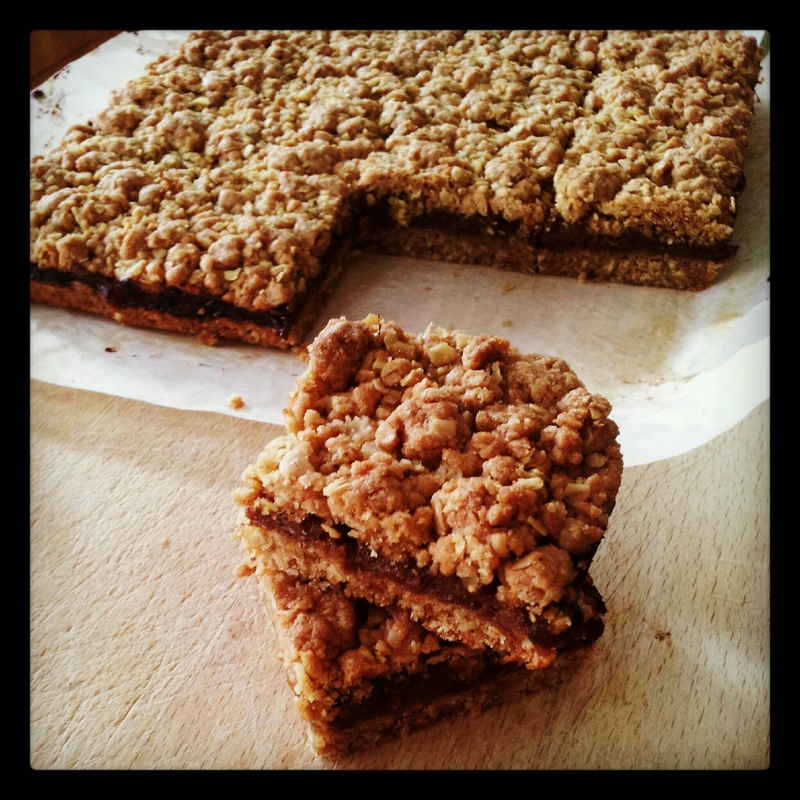 Happy baking, happier eating! Indian bread isn’t all about naan bread and chapatis. 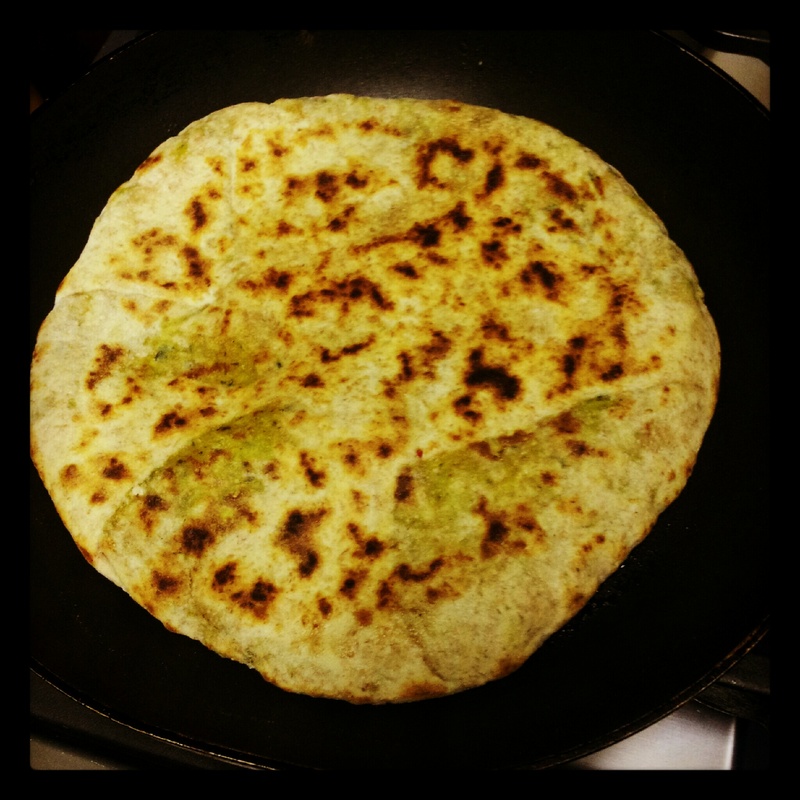 If you haven’t heard of them before, stuffed paratha is an Indian flat bread made with a wholemeal dough and a spiced potato (aloo) filling. They have no raising agent and can be cooked in a frying pan. They are traditionally a breakfast food throughout the Punjab and are popularly served with raita and even go in children’s and husbands’ lunch boxes. I love them on their own, with a big bowl of curry, with chutneys, pickles and dips, anyhow! They also freeze very well. 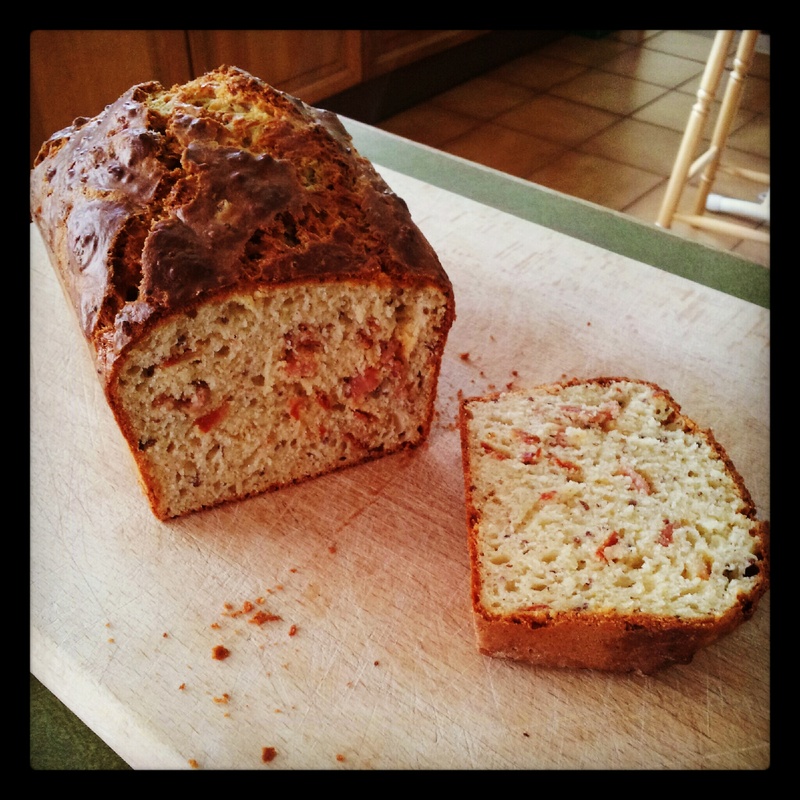 This recipe makes 6 breads so if you don’t need that many then you could halve the recipe or make too many so you have some in storage that you can pull out of the freezer for an easy and very tasty side. Once cooked, allow the unused breads to cool then divide each one with a layer of clingfilm and store in a ziplock bag in the freezer. For the stuffing, combine the grated potatoes, coriander, chilli, salt and spices and mix evenly. Set aside. To make the parathas, put the flour and salt into a large bowl and pour in the oil. Add 150-200ml of warm water to the flour gradually with your fingertips until you have a moderately soft and elastic dough. Knead well for five minutes. Shape the dough into a ball, cover with clingfilm and leave to rest for at least 30 minutes. Knead the dough briefly once more before forming into six equal balls. Lightly dust a work surface with flour and roll out one ball into an even 5 inch round. 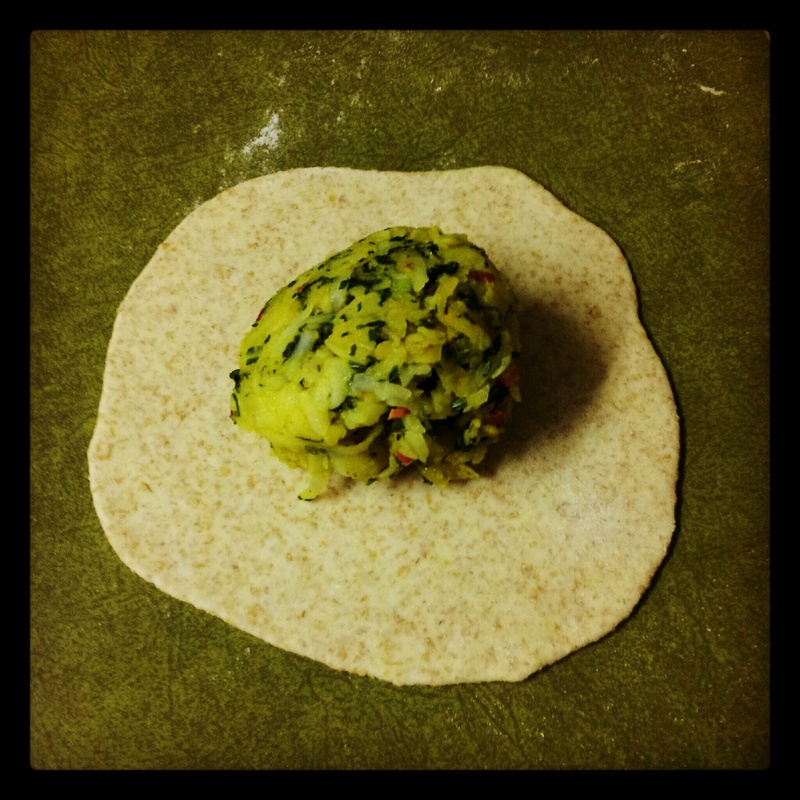 Take a sixth of the stuffing and place it centrally on the dough. Pull up the dough around the stuffing until it is completely covered. Twist off any excess dough sealing the potato in. Pat the ball to flatten into a round patty. 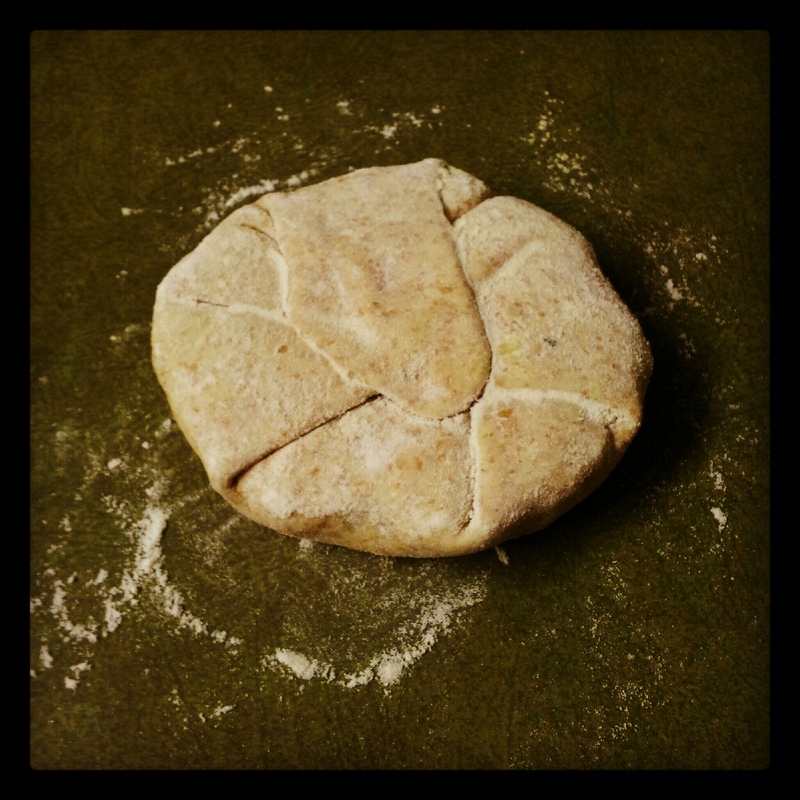 Spread a little extra flour on the work surface and roll the patty out very gently and evenly to a 6-7 inch diameter. It doesn’t matter if the dough occasionally breaks; simply sprinkle a bit more flour over the split and roll over it gently. Set a frying pan over a medium-high heat and allow it to become hot. Place the paratha on one palm and flop it into the hot pan ensuring it lies flat and in full contact with the metal. Leave it to cook for a couple of minutes before flipping. Coat the hot surface with the melted butter or ghee using the back of a spoon. After another couple of minutes, flip again and coat the other side with melted butter or ghee. Repeat the flipping process until the paratha is beautifully browned all over and no uncooked patches of dough remain. Remove to a plate and keep warm in a low oven. Make all the parathas in this way. This is such a light bread despite the double carbs as the dough is rolled so thinly and the potato is fluffy and flavourful. Paratha is awesome eaten steaming hot and crisp from the pan or you could store leftovers in the freezer as mentioned or in the fridge if you plan on using them in the next couple of days after making. Just reheat them in the pan over a medium heat. 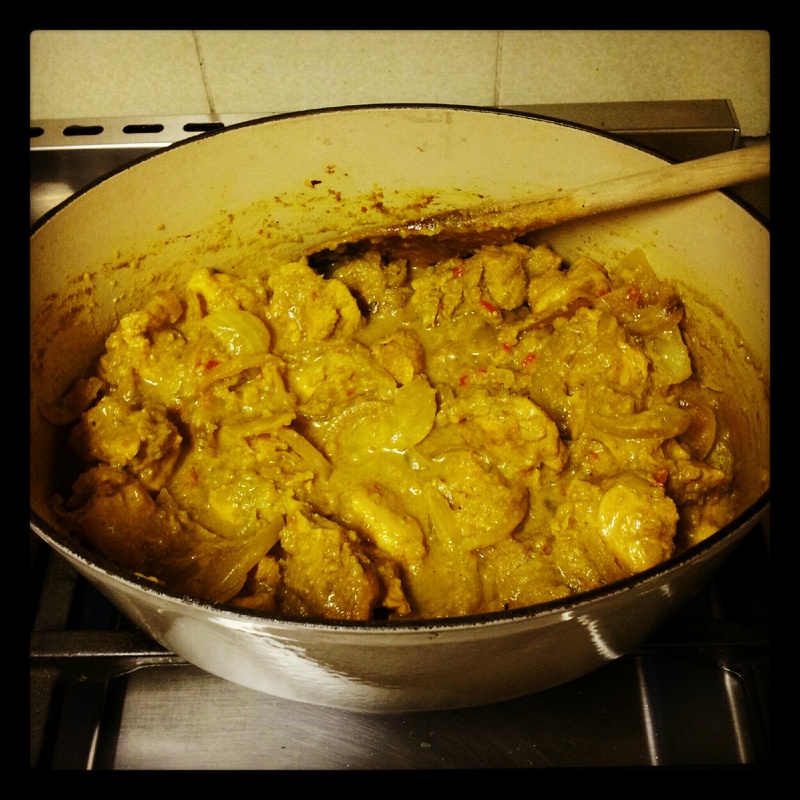 It’s National Curry Week! And what better way to celebrate than with one of the nation’s favourites? This Korma is not your average bland curry though. It is full of fresh flavours and uses a yogurt marinade instead of a cream sauce so it is better for you and I reckon, tastier too. Mix with the ginger and yogurt, cover and leave to marinade in the fridge for 2-4 hours or overnight if you’re that prepared. Place the chopped onions, red chilli (seeds and all for a nice background heat) and garlic into a food processor and blend until a smooth paste. Heat 1 tablespoon of oil over a medium heat in a large, heavy based pot and fry the sliced onions until they are golden brown. Transfer the onions to a bowl and set aside. Place the same pan back over a medium heat and add the other tablespoon of oil. When hot, add the ground coriander, pepper, garam masala and turmeric. Stir rapidly so the spice does not burn then after a few seconds when the spices become aromatic, add the chicken and the marinade. Adjust the heat to high and fry the chicken for 6-8 minutes, stirring frequently. Add the blended onion mix and continue to fry for 6-8 minutes more on a low heat. Add the coconut and the water to achieve a sauce thickness to your liking. Bring to the boil and stir until the coconut dissolves. Add the fried onions and salt, if using. Reduce heat to low, cover the pot and simmer until the chicken is tender (10-15 minutes). Sprinkle the ground almonds and mix well. Remove from the heat and add the lemon juice. Serve with plain boiled rice and a dollop of chutney. Look out for my stuffed paratha recipe which would be great with this too! 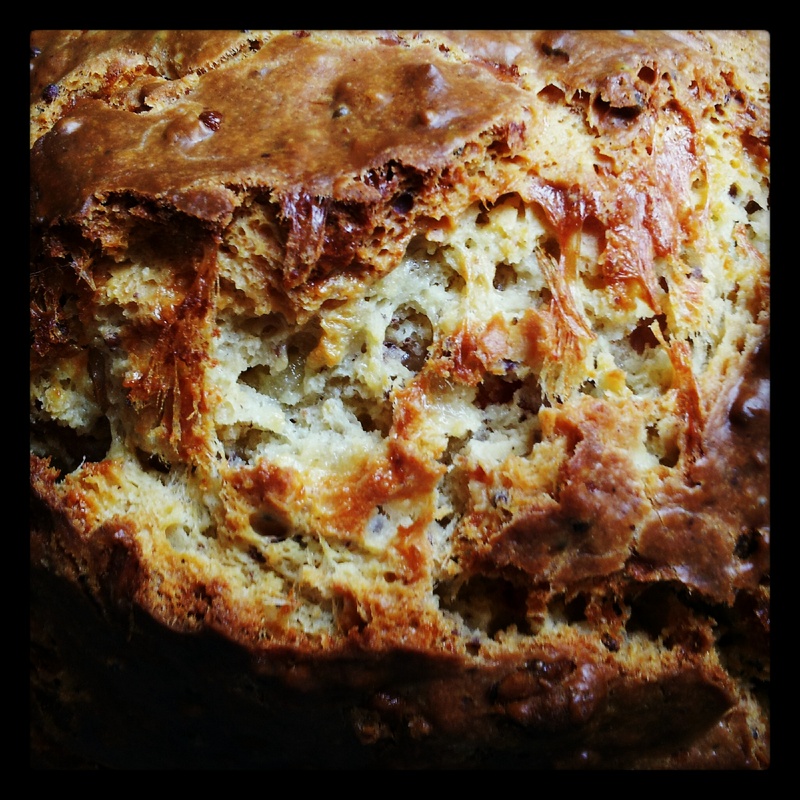 This is a seriously easy, no-nonsense recipe for savoury bread. Serve with soup or on its own with butter. You can use anything to flavour this bread. I just happened to have bacon and chorizo that needed using and of course cheese is a no brainer. You could try seeds, herbs, sun dried tomatoes, olives, whatever tickles your pickle. This bread is similar to a soda bread as it uses no yeast. 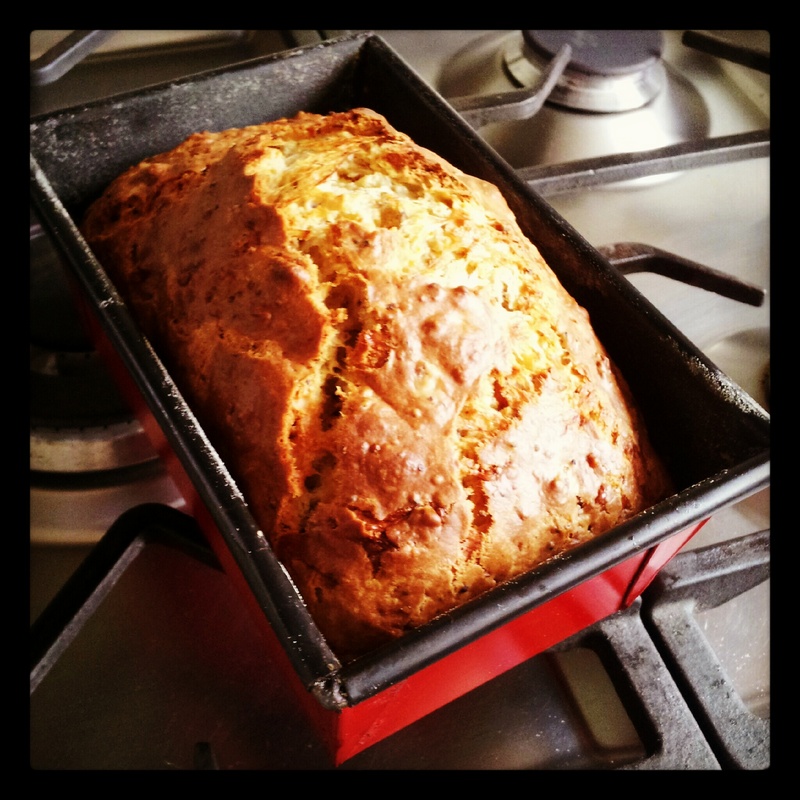 Baking powder is the only raising agent and the texture of the bread is almost cakey which makes it taste even more luxurious when you eat it. Place the bacon lardons and chorizo in a frying pan and heat until the fats release and fry until golden and crisp. Set aside to cool. Preheat the oven to 180C. Lightly grease and flour a 2lb loaf tin. Sift all the dry ingredients into a large bowl. Add the grated cheese and cooled bacon and chorizo and mix well. Pour the milk into a large measuring jug along with the oil, mustard and eggs. Whisk to combine. Make a well in the centre of the dry ingredients and slowly pour in the liquid, stirring all the time until it is fully incorporated, to form a fairly liquid dough. Pour the mixture into the prepared tin and bake in the oven for 50 minutes. Remove from the tin and allow to cook for a further 10 minutes to crisp up the bottom. When cooked, it will sound hollow when tapped on the base. Allow to cool on a wire rack before eating.